Treat your skin to the Bean Body Peppermint Coffee Bean Scrub; a luxurious, skin-renewing formula infused with Organic Cold-Pressed Coconut Oil to hydrate, exfoliate and soften from top to toe. Utilising Robusta Coffee Beans, the gentle body scrub minimises the appearance of cellulite and stretch marks, whilst Organic Cacao and Vitamin E provide antioxidant protection to repair and restore skin. Ideal for eczema and psoriasis, its blend of Himalayan Pink Rock Salt and Demerara Sugar buff away dead skin cells, helping to eliminate blackheads and breakouts for a smoother, more refined finish. Cruelty free. Vegan friendly. No parabens. Rub a large handful of scrub into wet skin using circular massage motions and focusing on problem areas. Leave to dry for 5 minutes and then rinse. Use weekly. Avoid contact with eyes. Can be used before fake tan. 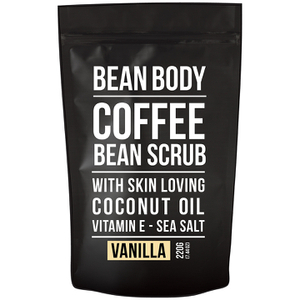 Fantastic smelling coffee scrub that leaves my skin feeling silky smooth. Kids walked in on me in the shower and were quite amused by the muddy look of this scrub. The only downside is a large proportion of it ends up on the shower floor.